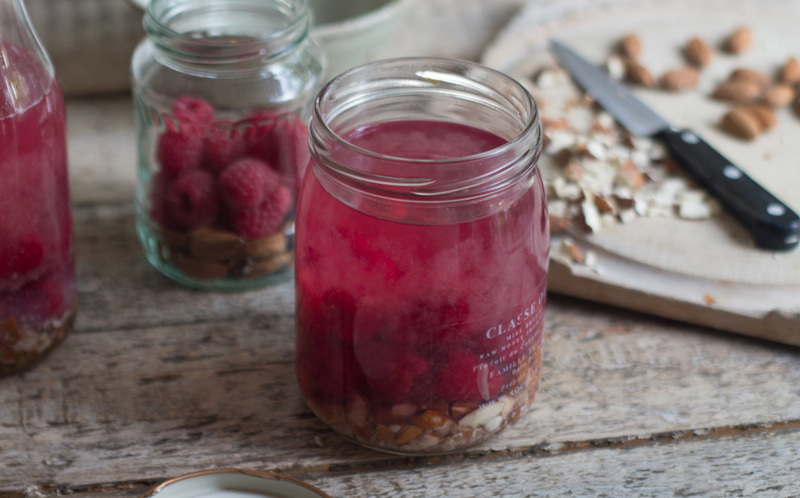 Sloe gin is always on rotation in our house and I love it but I’ve since discovered that is really easy to infuse gin, vodka or whisky with a load of different berries and fruits, which is good as the last jar of sloe gin usually makes it way out of the cupboard right around raspberry season. I take a jar of this with me to when I go for dinner with friends and it makes my beloved Gin and Tonic something that changes with the seasons. This is the base of my late summer G&T, when the raspberry bushes are groaning, I head to the pick your own farm I visited as a kid and fill a couple of baskets to make this. The almonds take it to a new level and give it a buttery backnote, think amaretto or frangleico. Any berries work here, blackberries, tayberries, elderberries or even soft fruits like damsons and peaches. Though the nuts don’t all work as well, I’d stick to untoasted unsalted almonds or hazelnuts. If you like you could use unrefined sugar in place if the agave. This recipe is pretty freestyle so you can sweeten more or less according to how sweet your tooth is. Sterilise x 4 jars or a big 1.5 litre bottle, I do this by running then through the dishwasher on a hot cycle or placing the clean jars on a baking tray and into a 100 ̊C oven for about 20 minutes. 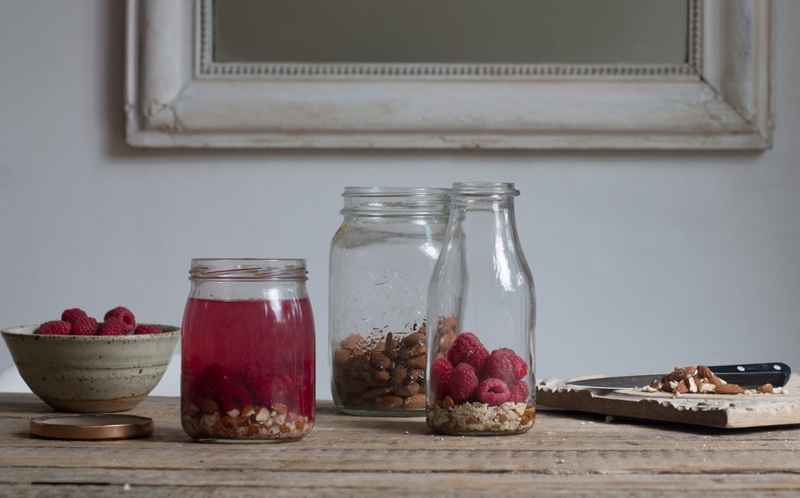 Next divide the raspberries and almonds between the jars and pour a tablespoon of agave into each jar. Top up with the gin and put the tops on. Leave to steep and infuse in a cool place for a least a couple of weeks but ideally about a month then strain and pour the barely pink gin into little jars or bottles for G&T or presents. I made bramble gin this Autumn which was gorgeous. I had to. I had originally made rhubarb and orange but sadly drank it all in the lead up to Christmas. Gonna try making this but will use cherries, hoping to get the bakewell flavour. Got a lime and chilli one on the go at the moment. Have made lots of flavours, but my favourite is strawberry.